Socrates says, “Shall we then, begin with Hestia, according to custom?” His cosmological idea of the universe was that “Ten divine celestial bodies [planets] rhythmically rotated” around a Divine Fire, which was the center of the cosmos. That Divine Fire was Hestia, she was the hearth of the universe. Today we know her as the Queen of the Fire, the Goddess of hearth and home, and Keeper of the Flame. Hestia was her Greek name, and her large round public temples mimicked the shape of the hearth and peasant huts. The temple fires were always lit so that private citizens could rekindle their home hearths. The Greeks called Her Hestia. Later the Romans would call her Vesta, with Vestal Virgins to maintain the fires. In early Greece, Delphi was a hub of goddess energy during the Mycenaean period. Delphi was a small village whose inhabitants worshiped the Mother Goddess. 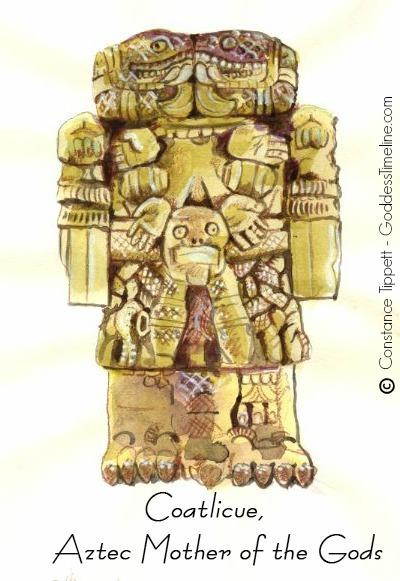 Small clay goddess statues were found in dedicated sanctuaries. Delphi also had the famous “gap” in the earth, where the original oracle would sit, inhale the rising vapors, become clairvoyant, and predict the future. Then during the Greek period, the Goddesses’ sanctuaries were built upon and taken over for the Greek god associated with the sun, Apollo. But the future would be still told by women, one of whom would become the the famed “Oracle of Delphi.” In 90 B.C. when Delphi was razed by the Thracian Maedi, the fires that had been burning uninterrupted for centuries, were extinguished. 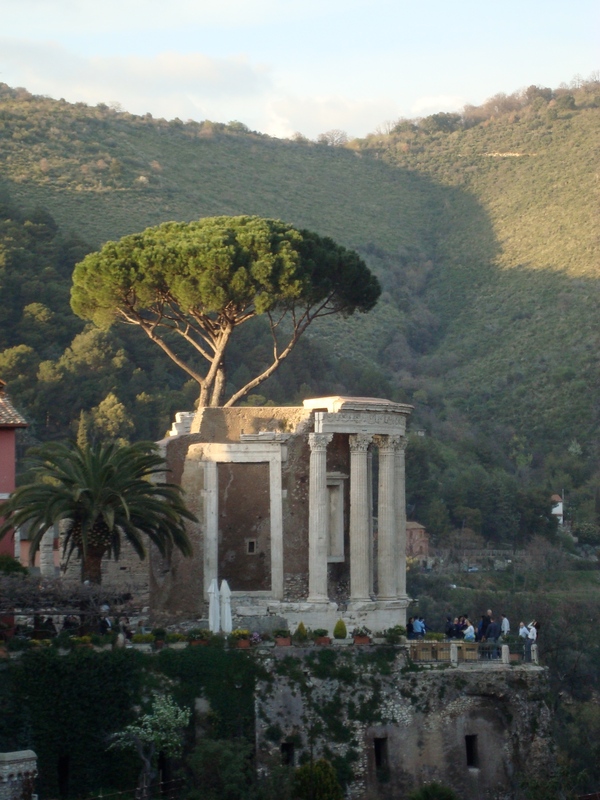 My favorite Hestia temple is a Roman temple to Vesta in Tivoli, Italy. It is sometimes known as the Temple of the Sybil “Vesta.” This splendid temple is most elegantly built and placed. It is perched on the side of a cliff overlooking the falls of the Aniene, which cuts a gorge into the surrounding tree covered mountains. In antiquity, as the hearth of the city, it was most likely constantly lit and would have appeared like a beacon of shelter to reassure the citizens of this city. I suppose you could say that the story of Hestia ends there. But the Queen of Fire has a past, and if we look backward in history we may find another story, how Hestia was born. It starts in Mother Russia with the Paleolithic statues of the old women. These figure were made, when the earth was in the midst of an Ice Age. Massive glaciers covered the northern Hemisphere and the earth’s climate was cold and dry. Nomadic groups of humans roamed along the edge of the glacier, from the Pyrenees to Siberia, hunting the woolly mammoth. In the Russian settlements of Kostenki and Avdeevo, archaeologists had a rare opportunity to find a collection of these figures in situ, complete with contextual information. 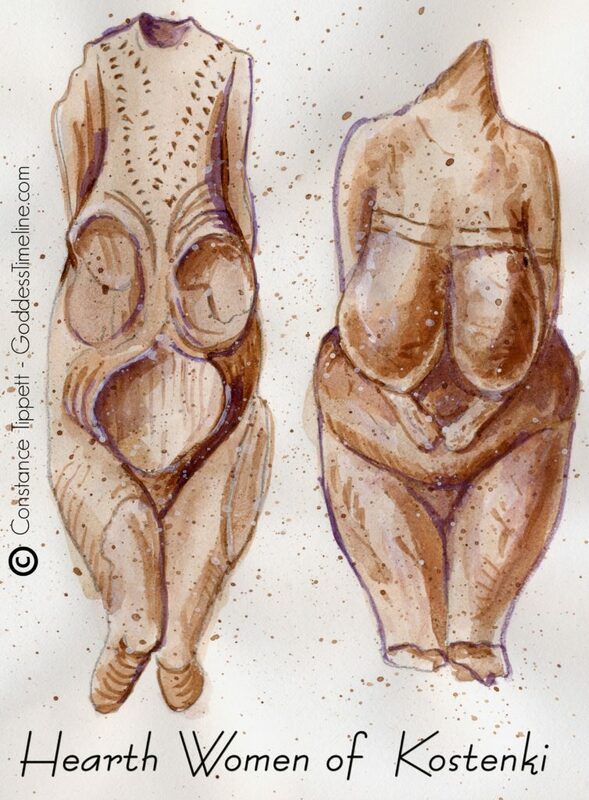 Inside their mammoth bone dwellings, ritualistically buried in storage pits, near the fire pits, were small figures of old women, their breasts and bellies sagging from child birth and age. These old women seemed to be staking their claim to hearth and home. What could be more life saving during a Paleolithic snow storm than a fire? Even though She didn’t have a name yet, Hestia was there. 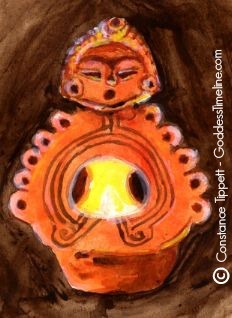 The Jomon people of Early Japan had a figure of the Fire Goddess, and the Ainu’s goddess is Kamuy Fuchi, the Goddess of the hearth. Kamuy Fuchi is a woman who lives in the hearth. Her position is so important that she never leaves her home because the fire in a hearth must never be completely extinguished. And in this century, when ethnographers began recording the culture of the Indigenous Tribes of Russia, they found that they had lived much like their Paleolithic ancestors. There was Hestia again. The Evek tribe women, shamans, were called “utagen” meaning hearth or fire women. The Tungus tribe believed that the spirit of the hearth takes the form of a clever old women, whose portrait is stored in each tent. The Somoyeds referred to the fire as “Old Grandmother Fire,” Guardian of the tent. Hestia shows Herself again in “Old Europe,” Yugoslavia around 5500 B.C. 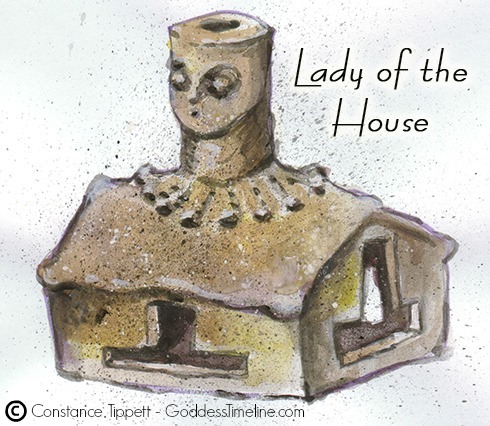 in a ceramic piece I refer to as, “Lady of the House.” Similar shrine models were found buried under temples. Her neck, adorned with a necklace, and head become the chimney, her shoulders comprise the roof. She has literally become the Sacred Hearth/Home/Temple. Next she shows up on the Eurasian steppes, around 600 B.C. amongst the Sarmatians who would later blend with the Scythians, and bury their dead in mounds called Kurgans. Archaeologist Jeannine Davis-Kimball found that the central burial figures often were hearth women, lending further credence to the speculations that this was a matriarchal society. And now we are in back in Greece and Rome, with temples in her name, Hestia/Vesta, who was at the beginning and center of the human universe. But does Her journey end here? No. When the Romans tried to colonize Britain they ran head-on into the indigenous deity of the island, Brigid, Goddess of the Hearth. She has come full circle and is now one of the Neo-Pagans’ beloved Goddesses in the 20th century. I, myself, vacillate between being an agnostic and a rabid spiritualist. But when my intelligent, scientific, rational, and scholarly inquiry consistently reveals this “archetype of the human collective unconsciousness,” I pause. I could understand how humans would identify women in their role as Keeper of the Hearth and deem it sacred. It is a natural fit. 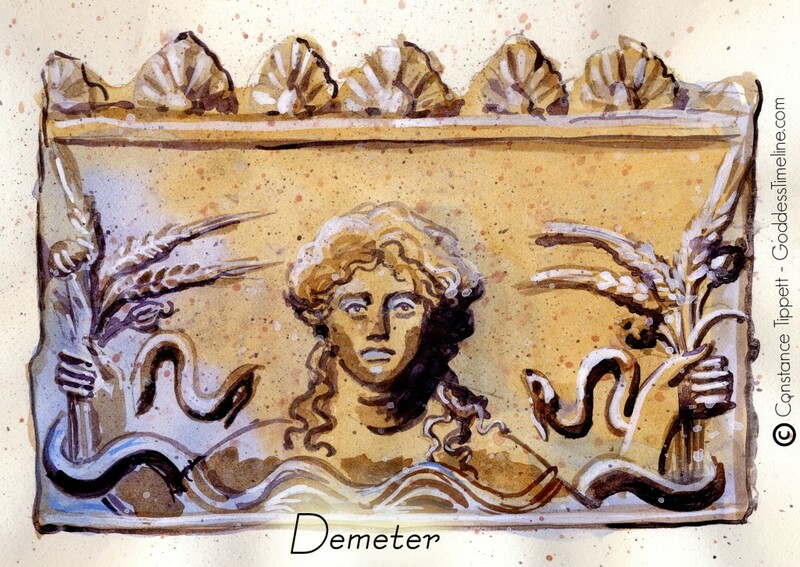 But take Demeter, in Greece, holding snakes as a regenerative symbol, and across the ocean, literally on the other side of the earth, Coatlicue the Aztec Goddess who becomes the snake, and then ask me if I believe in coincidence. That’s when I turn into a spiritualist, seeing underneath this physical facade of mater and observing the world of spiritual magic, chaos, and the unknowable. I glimpse flashes of the Divine Feminine in this world for just a nano-second. I revel in the feeling, trying to hold on to it, and then bow my head in reverence as She passes. Constance Tippett is an artist, and recently moved her studio to Portland, Oregon. 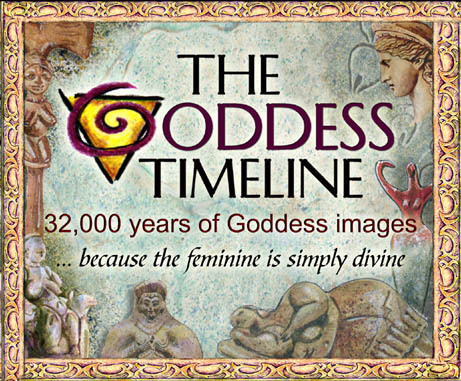 Nearly twelve years ago she started researching and constructing The Goddess Timeline which is a full color four piece poster set that documents the prevalence of Goddess statues from 30,000 B.C. 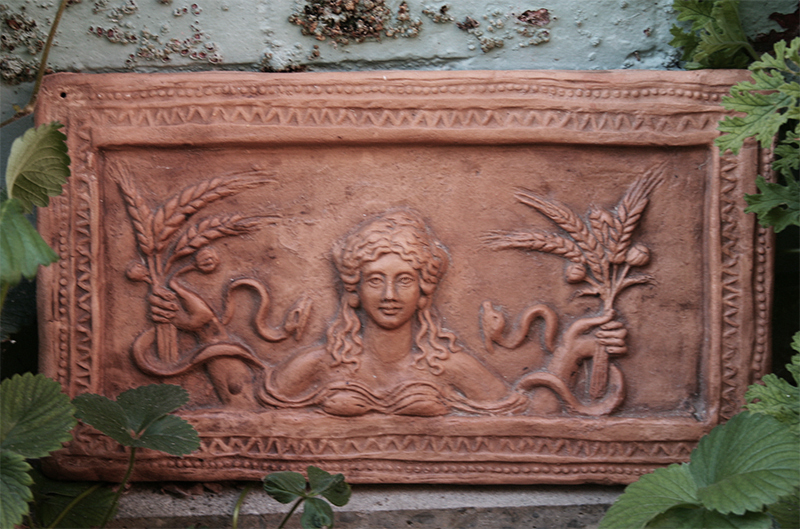 to 2,000 A.D. She also creates hand made terra-cotta museum quality replicas of Goddesses from around the world. Visit GoddessTimeline.com and explore. New gallery coming soon!